Today we are linking up at Grace Alone. Go over and check out some more thankful posts! Today I wanted to share with you what my wonderful husband got me for my birthday. First let me start by saying that he's not the romantic, touchy-feely kind of guy. I can count on one hand how many times he has bought me flowers in the last 11 years. I'm okay with that because he's faithful and an incredible provider. He loves me more than life, and I know that. I don't need flowers or chocolates to know just how much he loves and cares for me. When he gets up in the morning, sick, and works outside in the cold all day, installing heating units while being sick, just to make money to provide for us...that shows love! When he puts his paycheck in the bank and doesn't ask for a penny for himself...that shows love. When he spends his evenings and weekends with myself and our children instead of his friends, or elsewhere...that shows love. 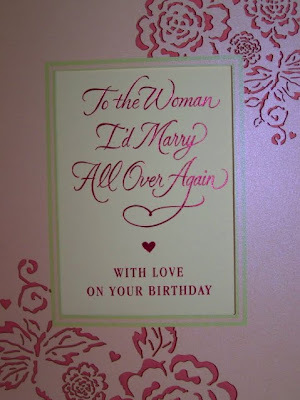 I must say, he has always been wonderful with cards! He's always wrote his own little sweet things on the inside too. I keep these cards and cherish them because it's the only time during the year that I hear these kinds of things. He always jokes and says that he told me he loved me when we got married, and he'll let me know if anything changes! But seriously, he tells me he loves me all the time, but in these cards he tells me how much I mean to him, how much he appreciates what I do for the family, and how wonderful of a mother I am. Things I need to hear on days when everything seems to be going wrong. I love having these cards to pull out and read on those days! I was so astonished when he had my youngest daughter hand me these! He said he wanted to get me roses that didn't die in a week. I have always wanted these little miniature roses, so I was on cloud 9! I had an old spider plant in this pot, and I was happy to dump it out and plant these in it. 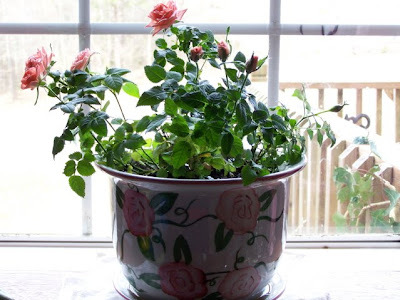 I have had this pot for years, and had several different plants in it...it looks like it was made for these roses! I wish I could have gotten a better picture of it, but with the light in the background..well you know. This is going to be stunning when the roses fill out some more! I am so thankful for my husbands thoughtfulness and gifts. I am thankful for God letting me see immediate results from my trying to be faithful to His Word, as far as my role as a help meet for my husband. Thanks for sharing this sweet post. I love roses! May God bless your marriage daily. I'm happy for you!! Special husbands are such a blessing! Your card and roses are beautiful!